Thursday, jurors got a never-before-seen look at the devastation left behind after the gun battle and explosions on Laurel Street in Watertown, Massachusetts, during the manhunt for the Boston Marathon bombing suspects. FBI Special Agent Brian Corcoran testified the pressure cooker bomb that was hurled at police as they took cover behind a tree, blew shrapnel in people's yards, on roofs, embedded in houses and ended up as far as a block away. 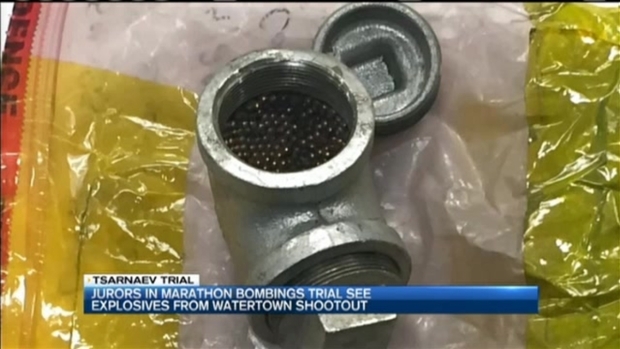 Corcoran testified the Fagor pressure cooker was the same brand as the pressure cooker bombs that exploded near the marathon finish line. Lawyers for Boston Marathon bomber Dzhokhar Tsarnaev have shown the jury that his older brother had receipts from an ammunition store and for two backpacks and a soldering gun purchased in the days and weeks before the attacks. Jurors also saw the lid of the pressure cooker that was blown into a hockey net in a yard four houses down and across the street. And the locking mechanism for the pressure cooker lid, which was found imbedded in a home at 55 Laurel St. 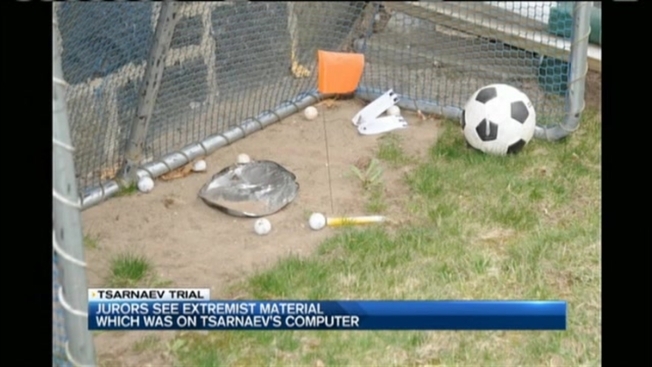 The government also showed jurors the items found in this computer bag removed from the Tsarnaevs' green Honda Civic left behind on Laurel Street. It included a "modified piece of electronics" Corcoran called a transmitter, along with a hard drive and cell phone. Prosecutors spent several hours questioning FBI forensic examiner SSA Kevin Swindon about data found on those items as well as other laptops, cell phones and thumb drives belonging to Dzhokhar Tsarnaev, allegedly showing that he downloaded several issues of Inspire magazine, published by al-Qaeda in the Arabian Peninsula and several audio files and lectures from now deceased Islamic militant Anwar Al Awlaki.